Discovery PICO represents the second generation of pico laser (picosecond) that due to its proprietary technology, is the most innovative medical laser available in the market today. When the laser radiation is emitted at nanoseconds and picoseconds pulses and the power density is in the range of the GW and the laser light is absorbed by clusters or particles of ink or melanosomes, it generates an extremely rapid rise of temperature up to more than 900° C (¹). This rapid heating induces an extremely fast expansion in the target, which generates a mechanical wave (acoustic) that crosses over the target itself. The generated wave exerts a pressure that exceeds the fracture threshold of the target, causing its fragmentation (²). Thereafter, the fragments can undergo phagocytosis by macrophages and be removed through the lymphatic system. 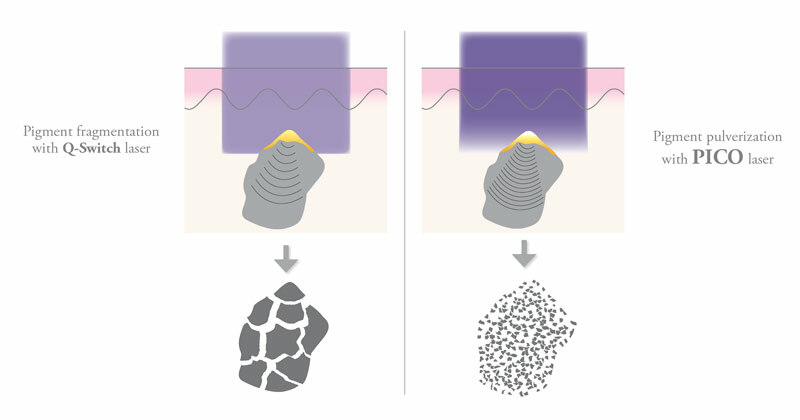 This is the process called photoacoustic effect which is literally able to “pulverize” particles. To make this happen at the best conditions, the laser pulse duration must shorter than the time of crossing over of the mechanical wave within the target, which for ink clusters is in nanoseconds and for the smallest ink particles and single melanosomes is in the picosecond range, all this leaving the surrounding tissues unaffected. The picosecond YAG laser can break down the smallest ink particles which compose the black tattoos. This color, due also to the very small dimensions of its particles, sometimes become resistant to Q-Switched treatments showing small improvements at every session. The picosecond pulse can fragments even the smallest black ink particle in a really thin “dust”, which is easier to be eliminated by the body immune system. 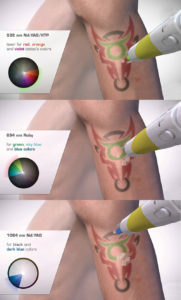 By emitting at both 532 nm and 1064 nm wavelengths at picosecond regime, Discovery PICO can treat different tattoo colors, superficial and deep pigmented lesions by using also the Q-Switched emission modes. As an exclusive feature of this laser, the Photo-Thermal mode permits to treat also the aged skin (skin rejuvenation) effectively. The Q-Switched Ruby of the Plus version (optional) of Discovery PICO effectively extends the range of treatable colors. This is the most effective laser for the treatment of blue and green colors due to the very high pulse energy able to really break down the ink clusters. The particles of colors treated by this laser are in average bigger that the ones composing the black ink and are really well responding to ns pulses too. 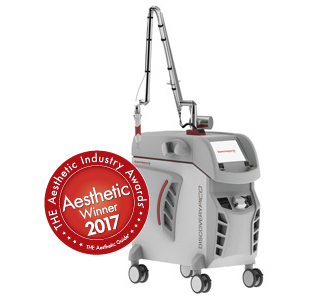 This version is the first picosecond yag laser with the same specifications of Discovery Pico combined with a ruby laser able to delivers up to 1.2J of energy and not just few hundred mJ such as other “red” lasers. The 694 nm of Discovery Pico Plus are generated by the most advanced and powerful ruby laser available in the market: very high energy per pulse in Q-Switched or Photo Thermal pulses, big spot sizes and fast repetition rates make this laser, together with the 532 and 1064 nm which work also in picosecond regime, a real solution for the treatment of almost all tattoo colors and pigmented lesion even on very dark skins and represent the best combination for unmatched treatment efficacy and safety. Want to know more about Discovery PICO?